Our thoughts and prayers turn to our Gulf Coast neighbors in need after Hurricane Harvey made landfall near Corpus Christi and precipitated historic flooding in Houston and surrounding communities. As the late Fred Rogers urged us years ago, we should spend less time dwelling on the catastrophe and focus instead on the “helpers” among us—those who choose to brave the rising waters to save families trapped in homes, those who provide shelter to the displaced, and those who purchase and distribute food, water, and clothing to the victims of this tragedy. In fact, you may want to be one of the helpers. This is not a complete list, but we've thrown together a few ways you can help those affected by the storm and included useful hyperlinks. Monetary donations are more flexible and cause less of a strain on the charity in times of crisis. As a spokesman on television said last night, unlike material donations, cash involves no transportation costs, shipping delays, or customs fees. It also enables relief organizations to spend more time providing aid by spending less time managing goods. Donations to support The Salvation Army's Hurricane Harvey relief efforts can be made at helpsalvationarmy.org or by calling 1-800-SAL-ARMY. 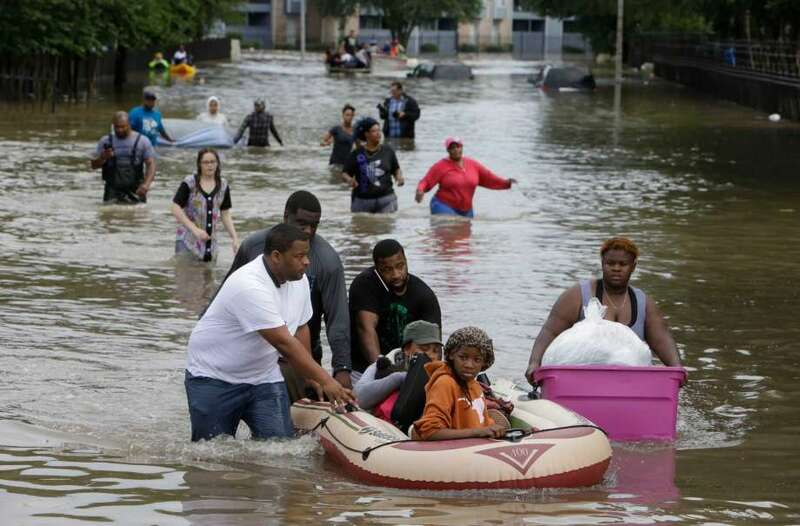 The Hurricane Harvey Relief Fund set up by Houston's mayor, Sylvester Turner, and administered by the Greater Houston Community Foundation is another great way to provide aid. The Houston Food Bank and the Food Bank of Corpus Christi are asking for donations. To help animals suffering from the disaster, visit the Houston Humane Society or the San Antonio Humane Society. The Texas Diaper Bank in San Antonio is asking for diapers and wipes, which can be mailed to 5415 Bandera Road, Suite 504, San Antonio, Texas 78238. AABB, which coordinates a task force to manage blood collection efforts during disasters, put out a call on Sunday for blood donations in the aftermath of Harvey. American Red Cross: 1-800-RED CROSS (1-800-733-2767), Blood Assurance: 785 Shugart Rd, Dalton, GA 30720, 706-226-7735, Armed Services Blood Program: 703-681-5979, or AABB: 301-907-6977. GoFundMe has created a page with all of its Harvey-related campaigns. Airbnb is waiving service fees for those affected by the disaster and checking in between Aug. 23 and Sept. 1, and can guide users in creating a listing where their home is offered to victims free. YouCaring has a fund-raising page set up by J. J. Watt of the Houston Texans with a goal of $1 million. GlobalGiving's Hurricane Harvey Relief Fund supports local organizations by helping with "immediate needs for food, fuel, clean water, hygiene products and shelter. You, too, can be a “helper.” As always, if you have a specific question about relief efforts or how you can make a difference, give me a call at the office at (706) 275-9117.